Balloons, flowers, banner and cheers completed the party, as Heritage Communities celebrated their 1,000th resident today. Although the company has served thousands of seniors during its 15 years of operations, it is the first time Heritage Communities has served 1,000 seniors throughout the properties at the same time. Shirley Junck, the latest resident to move into The Heritage at Northern Hills, marks the 1,000th resident at Heritage Communities. Before the announcement was made on Thursday, September 29th, all ten of the Heritage communities eagerly awaited the announcement of where the 1,000th resident would move in. 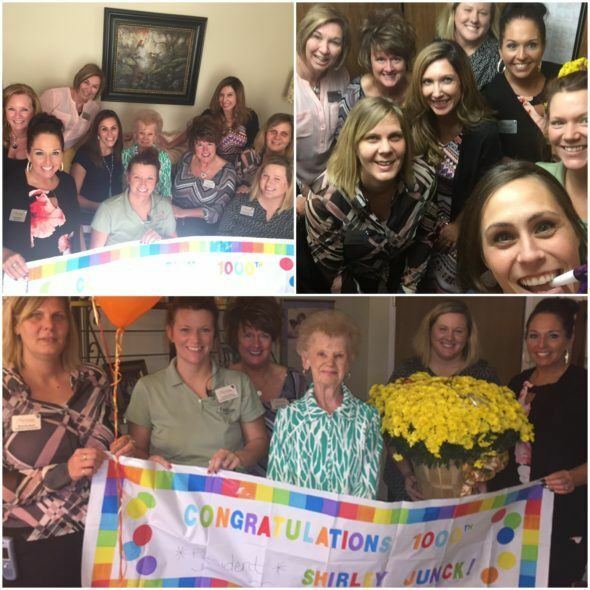 On the 29th, a team from the home office in Omaha surprised the associates and Shirley at The Heritage at Northern Hills with the news. Prior to 2015, Heritage Communities operated with 775 apartments in their portfolio. With the opening of The Heritage at Sterling Ridge in February 2015, the company added 108 apartments. One year later, 121 additional apartments were added when The Heritage at Legacy opened in January 2016. With an increase in available apartments comes the opportunity to help more seniors in Nebraska, Iowa and Arizona where Heritage properties currently exist. We have had multiple opportunities to grow our company fast, and add many more properties said Farhan Khan, CEO of Heritage Communities. But we have been very strategic in our growth, purposefully growing at a steady pace to ensure our core values of Compassion, Respect, Trust and Fun are being implemented in each community ñ and that we dont lose sight of the very reason we are in business: the residents. The Heritage at Northern Hills is located at 4000 Teton Trace in Sioux City, IA. Heritage Communities, the corporate office is located in Omaha, where they own and operate 10 senior living communities, two additional properties are currently under construction in Grand Island, NE and Glendale, AZ.